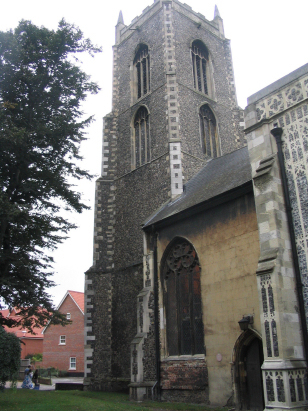 The parish of St Michael Coslany lies in the northern portion of the mediaeval city of Norwich, that portion often known as Norwich-over-the-Water as it lies to the north of the River Wensum. In common with most city parishes it covered a relatively small area of the city, just a few blocks in modern terminology. That small area would, however, have been intensively occupied as folks were crammed cheek by jowl into cramped yards. Whilst the area was not as poor as the rookeries of the city it was a place where, at least at the start of this transcript period, weavers and dyers worked and lived. As that industry faded from the scene the area was still a hive of industry with artisans of all trades but dominated by the growing shoemaking trade. Today the area has been transformed with the crowded yards replaced by modern flats and terraces, popular with the young for its proximity to the city's attractions and most industry has left for the fringes of the expanding urban area. St Michael Coslany sits at the junction of Colegate and Oak Street and is no longer used for worship. Formally a science learning centre at the date of writing the church is now used to teach circus skills, a far cry from its creator's intentions. 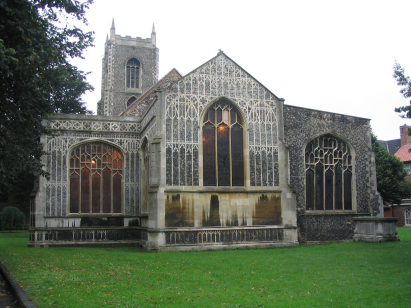 By Norfolk standards the church is relatively young, more the result of rebuilding rather than a late foundation. Most of the building is early 16th century, albeit the tower carries dates of 1422 & 1428 indicating it probably remained from a prior version. The tower is, perhaps, the church's best feature, impressively tall and in four stages it is a distinct landmark for this area. The remainder is all late Perpendicular in style and that format is a familiar feature around the county. The church sits within a compact churchyard which is open to the streets, there are quite a few trees around making it tricky to adequately obtain photographs. Two standard register books cover the period of this transcript, the first of 1600 entries, the second of 800. These registers are filmed on Microfilms MFRO36 & 37 in the collection of Norfolk Record Office which were used to prepare this transcript. These films are relatively recent in their preparation and of superior quality to the previous fiche. The records were, however, written by a large number of clerks over the years and not all were the neatest in their scripts. There is a likelihood of a few misreads as a result of poor clerical workmanship as a result. The gaps in numbering are attributable to some of the clerks commencing a new page at the start of a new year leaving the prior page with blank spaces.